The United States Congress designated the Cabinet Mountains Wilderness (map) in 1964 and it now has a total of 93,272 acres. All of this wilderness is located in Montana and is managed by the Forest Service. The Cabinet Mountains Wilderness is a 35 mile long range of glaciated peaks and valleys trending north and south. The wilderness is framed by the Kootenai River on the north, the Clark Fork River on the south, Highway 2 on the east, and the Bull River and Highway 56 on the west. Elevations range from a low of 2,880 feet to 8,738 feet atop Snowshoe Peak. Designated a Primitive Area in 1935, the 94,272 acre area then became part of the National Wilderness Preservation Act of 1964, and is defined as, "an area where the earth and its community of life are untrammeled by man, where man himself is a visitor who does not remain......" The Cabinets obtained their name from early French explorers who noted that the rock formations along the Clark Fork river looked like boxes or cabinets. Most of these rock formations are now under the Cabinet Gorge Reservoir but some are still visible. Variety best describes the Cabinet Mountains Wilderness, ranging from the high, rocky peaks often snowcapped year-round, to groves of huge cedars in the canopied valleys. Hidden in the peaks and ridges are scores of deep blue lakes, feeding clear, cold streams that tumble to moose country below. This Cabinet Mountains have had use through time. The Kootenai Indians used the area to hunt big game. The mountain goat was prized for its pelt and was a rich food source. Many plants adapted only to high altitudes were gathered for food and medicines. Beginning in the 1880's the area was used by Euro Americans. The earliest and most extensive historic use has been mining activity. 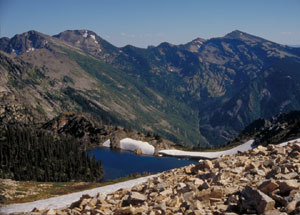 Mineralization was discovered in the southeast part of the wilderness and since has become known as the Snowshoe Fault. Mining at some scale has occurred along this fault sporadically since the early 1900's. Clean and pure are the simplest and most accurate ways to describe the water that comes out of the wilderness. Past studies have rated this water among the top 5% purest water in the lower 48 states. Bringing your own water or using a water purifier is still recommended. The remnant of one alpine glacier still exists, Blackwell Glacier resides on the north slope of Snowshoe Peak. Other permanent snow fields can be found near Little Ibex lake and Elephant Peak. Patches of snow sheltered by mountainous ramparts are often found in the high country throughout the summer. Planning to Visit the Cabinet Mountains Wilderness? How to follow the seven standard Leave No Trace principles differs in different parts of the country (desert vs. Rocky Mountains). Click on any of the principles listed below to learn more about how they apply in the Cabinet Mountains Wilderness.